Based on the true story of the Queen of England’s father and his remarkable friendship with maverick Australian speech therapist Lionel Logue. "The King’s Speech" stars Academy Award nominee Colin Firth as King George VI, who unexpectedly becomes King when his brother Edward abdicates the throne. Academy Award Winner Geoffrey Rush stars as Logue, the man who helps the King find a voice with which to lead the nation into war. After the death of his father King George V (Michael Gambon) and the scandalous abdication of King Edward VIII (Guy Pearce), Bertie (Colin Firth) who has suffered from a debilitating speech impediment all his life, is suddenly crowned King George VI of England. With his country on the brink of war and in desperate need of a leader, his wife, Elizabeth (Helena Bonham Carter), the future Queen Mother, arranges for her husband to see an eccentric speech therapist, Lionel Logue (Geoffrey Rush). After a rough start, the two delve into an unorthodox course of treatment and eventually form an unbreakable bond. With the support of Logue, his family, his government and Winston Churchill (Timothy Spall), the King will overcome his stammer and deliver a radio-address that inspires his people and unites them in battle. 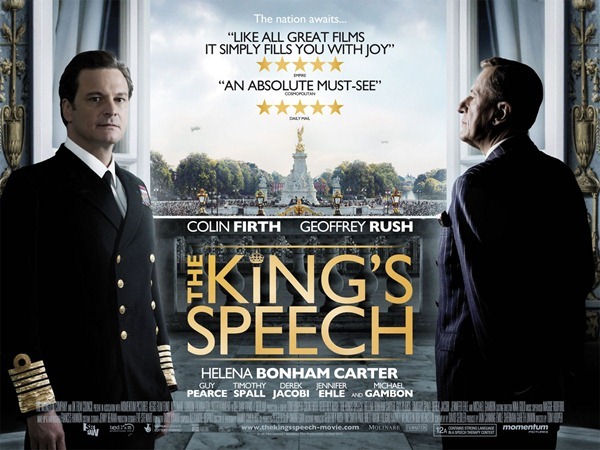 Based on the true story of King George VI, THE KING’S SPEECH follows the Royal Monarch’s quest to find his voice. The award-winning cast includes Helena Bonham Carter as Queen Elizabeth the Queen Mother, Guy Pearce, Derek Jacobi, Timothy Spall and Michael Gambon. EN Review: This is not just a period piece, we usually do not care for them at all, this is a slice of life and history. It’s a perfect package featuring top notch acting, directing, and a perfect script and beautiful cinematography all come together and watching this you can see exactly why it won every award.